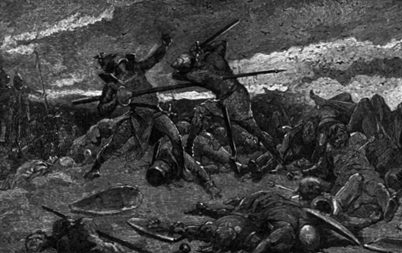 Here begins the most dolorous tale of the Battle at Camlan and the Death of Arthur. It is an ancient tale, and I pray my telling of it be pleasing to all. Long ago, when Arthur ruled his Court at Camelot, the terrible war against Lancelot and his kin ended in a truce, with the Queen returning to Camelot, and Lancelot remaining at Joyous Gard in the Summer Country. When this news reached Mordred, he was most distressed, for it meant his plan to destroy Guenivere had failed. He was not the only knight upset with the outcome of the war, for many still distrusted the Queen and also believed that Lancelot had acted dishonorably when he rescued her from the fire. When they learned that Arthur had forgiven both Guenivere and Lancelot, many felt he betrayed the law, and therefore the kingdom. Sir Mordred siezed upon this feeling, rallying many to his camp. As regent in Arthur's absence, he declared that the King was no longer fit to reign. And as Arthur's only son, he proclaimed himself Pendragon. Arthur's loyal followers quickly fled Camelot, including Sir Bedivere and Sir Kay. Queen Guenivere took refuge in London, locking herself in the Tower. But many more knights and lords were loyal to Mordred, and they began fortifying Camelot against Arthur's return. In the meanwhile, Arthur and his remaining companions were riding from the Summer Country when Kay and Bedivere brought him news of Mordred's actions. At once the King wished to ride his men hard to Camelot, but Sir Kay counseled against this. "The warriors have ridden hard, my lord," he said, "and the recent war has left them exhausted." "Sir Kay is right, my king," said Bedivere. "Rest here, and send for Sir Lancelot. Mordred would not dare face you with Lancelot at your side." And so Arthur ordered that camp be made, and he sent messengers to Lancelot. The King also sent messengers to Camelot, warning Mordred that he would soon arrive to reclaim his throne. Mordred began to grow fearful, and he sent his own messengers to Arthur, asking for a meeting to arrange a truce. But Arthur's heart was hardened by Mordred's betrayal. He would offer no treaty, unless Mordred was willing to surrender his claim to the throne. And so Mordred's men returned to Camelot with the King's angry words. That night, the King thought he would sleep but lightly. Instead he fell into a deep slumber, and he dreamed that his nephew Gawain appeared before him, young and well again. "Arthur, my King," said Gawain's spirit, "you must not fight Mordred tomorrow. If you do, you will die, and the Round Table will be lost. Make peace with your son, and wait for Lancelot to join you. It is the only way." Arthur arose, disturbed by this vision. He called for messengers and said to them, "Take this word to Mordred: I will meet him on the Plain of Camlan at noon tomorrow. There we may parlay under the banner of truce." The men were quickly dispatched, and returned with word that Mordred accepted the King's offer. Sir Kay then took Arthur aside, saying, "My King, I have been your loyal supporter since the day you drew the Sword from the Stone. I have stood with you against rebel Kings and Saxon invaders, and when others undertook the Quest for the Grail, I stayed at your side in Camelot." "I have never had reason to question your loyalty," said Arthur. "A more ture companion could no man ask." "Then tell me this, not as King to Knight, but as foster-brother to foster-brother: would you truly negotiate peace with Mordred, the welp who would usurp your throne?" At this Arthur sighed heavilly and sat beneath a tree, bidding Kay to sit beside him. "I have grown old and tired of war. I have seen too much of death and bloodshed in my lifetime, the moreso in these past weeks. I cannot live forever, despite what my bards try to tell people. And when I die, I leave no heir but Mordred." "There are other noble men," said Kay. "There is no law which says you must make Mordred your heir." "And who would I appoint? I suppose Gawain would have been supported, but now he is dead. Lancelot perhaps, but he has lost the faith of the other knights, and of the people themselves. No, Mordred is the only choice. Any other, and civil war would destroy the Kingdom. Mordred will be King, and if I must acknowledge that publically to satisfy him, if it will bring peace again to this land, then that is what I must do." He left Kay beneath the tree to contemplate these thoughts. Arthur went to a peaceful glade away from the camp and prayed for guidence. If he had any visions, I make no mention of them here. At noon the next day, the two armies met on the Plain of Camlan. The air was thick with anxiety, both all were warned not to draw a single weapon, unless someone from the other side did so first. A table was placed in the center of the plain, with a chair at either end. Mordred chose wisely not to wear the crown, which he left in Camelot. Arthur and Mordred sat at the table a long time, staring at one another in silence, until at last Arthur spoke: "Has it come to this at last, my son?" Mordred's voice was filled with guarded vemon, "You are old and weak Arthur. It is time for you to step aside and allow a younger man rule this land." "With age comes wisdom, Mordred. And you will find I am not so weak as you would believe." "Be that as it may, Arthur, your time has ended. The Round Table is shattered, the Knights scattered or dead. Your remaining followers are few. Even the common folk cry out for change." "Change is inevitable. All things end, just as all things must have a beginning. One day you may find yourself in my place, with an upstart heir eager to tear out your throat. That is the one lesson I would hope to teach you, that history is destined to repeat itself. For your sake, Mordred, I hope you remember this day." The King and his son spoke this way a long while, with Arthur refusing to step down as King, and Mordred refusing to await his father's natural death before donning the crown. As they parleyed, their armies stood poised on opposite ends of the field, watching eagerly. For hours they stood, their muscles tensely wound. Then, as a knight shifted uncomfortably from one foot to another, an startled adder struck at his armored leg. Out of instinct, the man drew his sword to kill the serpent. The other army saw this as a sign of trechery and drew their own weapons. Before anyone could put a stop to it, both armies were engaged in battle. And the Battle at Camlan was begun. The carnage was terrible. At the end of the day, Arthur and Mordred stood face to face, surrounded by the bodies of their companions. The King held his sacred sword, Excalibur, while Mordred leaned wearily upon his lance. "So, Father," he said. "It comes down to the two of us." "This is your last chance, Mordred," said the King, "to make peace with me. Surrender now, or you will die." "If I surrender now," said Mordred, "I have no reason to live." And with that, he thrust his lance into Arthur's breastplate. So hard was the thrust, that the lance pierced through the King and out his back. Arthur gasped, his knees weakening. But as he looked about the battlefield and saw himself surrounded by death on all sides, he said, "You have destroyed my Kingdom and shattered the best company of Knights the world has ever known. I too have no reason to live, nor any reason to grant you victory." With inhuman power, Arthur pulled himself along the lance shaft, until he was within Mordred's reach. Then with the last of his strength, he swung Excalibur at his son's head, so that the sword cleaved through metal, flesh, and bone. And then it was done. Mordred lay dead, and Arthur dying, tears filling his eyes at the losses he had suffered. An hour later, Sir Bedivere, who had been knocked senseless in the battle, regained himself and rose unsteadily to his feet. All around him, the Knights of the Round Table and those who had been loyal to Mordred lay dead, and it seemed to Bedivere as though the enitre world had been slain that day. Not another man rose from that battle, and anyone who says otherwise is a liar. Bedivere searched the carnage until he found the King. At first he thought Arthur was dead, but as he kneeled at his sovereign's side, the King's eyes opened, and he spoke: "Bedivere, my friend, who else has lived? Kay? Bors?" "None, my lord. None have survived. All are lost." "Not lost," said Arthur weakly. "Never lost. Simply... elsewhere." "I do not understand," said Bedivere. "I know, my friend. In time, perhaps you will. But now there is something you must do." "Anything, my lord. Name it, and it shall be done." "Take this my sword, Excalibur. Go and find a lake, a pool, any still body of water. There you must throw the sword. Do this, then tell me what you have seen." Then Arthur lapsed again unconscious. Confused, Bedivere took the sword from the King's hand. He found a horse and rode until he came upon a lake of still water. Bedivere held Excalibur high above his head, ready to fling it, but he could not bring himself to do so. Instead he hid the sword there by the lakeshore and rode back to Camlan. "What did you see?" asked Arthur. "I saw nothing but the wind upon the waves." "Ah, Bedivere," groaned the King, "you have failed me." "I could not do it, Arthur. Other men will come, other kings." "And they must earn the sword, as I did. Now go, Bedivere. Trust that I am right, and do as I ask." 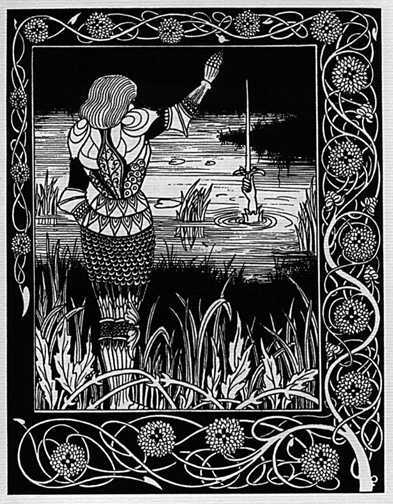 So Bedivere returned again to the lake, and this time he threw the sword as far across the lake's surface as he could. And then a miraculous thing happened, for it seemed to him that a lady's hand, clad in purest white samite, rose from the water and grasped the sword by the hilt. The hand brandished the sword thrice, then sank beneath the waves. More puzzled than ever, Bedivere returned to Camlan. A heavy fog had risen, and Bedivere stumbled through it, searching for Arthur, but he was nowhere to be found. Then, it seemed to Bedivere that he saw a barge sailing upon the fog itself. Lying in the barge was King Arthur, still barely alive, with three great Queens attending him. And one of these Queens, he saw, was the Pendragon's own sister, Morgana le Fay. Here ends the Tale of the Battle at Camlan. May the Blessed Spirits of all who perished that day be pleased with my telling of the tale, and may my ancestors smile upon me, now and ever.